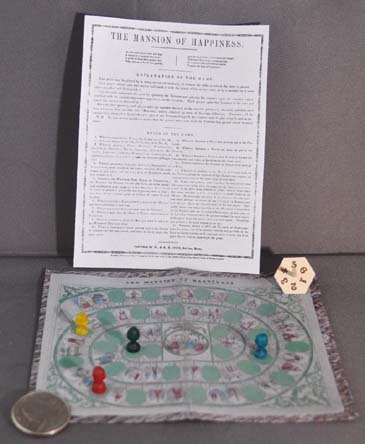 This is a reproduction of a game that, in 1843, was one of the first board games published in America (the first was Lockwood's Traveller's Tour through the United States in 1822. It was printed by W. and S.B. Ives (not the same Ives who joined with Currier in producing famous lithographs). It's design is as a spiral pursuit game. Designed for children, some of the spaces contained virtues or vices. If you landed on a space with a virtue, e.g., honesty, you moved forward a certain number of spaces because "someone who is honest moves toward happiness." But, if by chance you landed on a space with a vice, e.g., sloth, you moved backwards because "someone who is slothful moves away from happiness." So not only did a child play a game but also received instruction in social values. 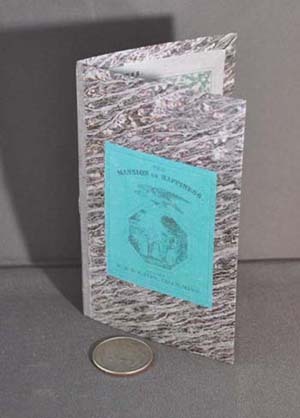 The came comes complete with the miniature game board, a shrunken copy of the rules (a larger copy of the rules is also included), 4 players'pieces, and a teetotem which was used instead of a die. Caution: This miniature game contains small pieces that could constitute a choking hazard and is not intended for children under the age of 3.